Chinese Translation Project -- Help us translate Science and Health into Chinese! Another productive evening of coding, almost ready to share! We had another excellent and productive evening of coding, once again meeting at Twitter’s HQ in San Francisco (one of the benefits of having two Twitter engineers on our team!) Our goal was to to try to get the project launched but there remain a few outstanding issues to finish resolving. Stay tuned! (Want to keep up on the progress? Follow our commits on Github). CS Hackathon meet up tonight at Twitter again, 6pm. Hoping to launch the translation project live tonight! Email Cameron if you want to be added to the list. About Page (OR should we just put a link on the home/landing page that goes to cshackathon.org?) <= YES! 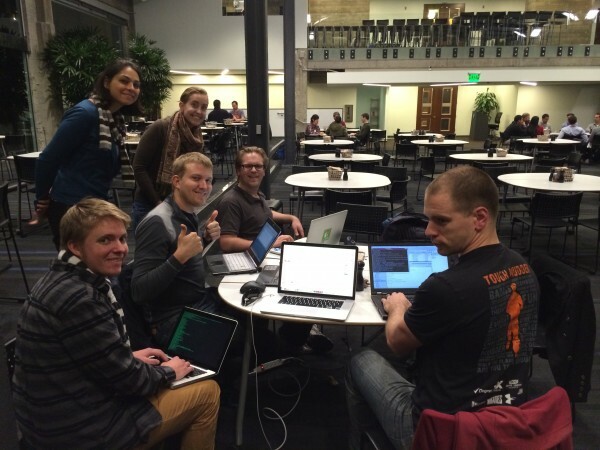 CS Hackathon at Twitter – Fire! Participants gathered on December 14, 2013 at the Berkeley CSO to work on Pleasant Viewer and other ideas. Bugs were fixed and a new project was started that aims to help translate Science and Health into Chinese. Gabriel, Julian, Cameron and James from Twitter, Cristi, Michael, Ansley, Alan from Oracle and Chris from Google all contributed. Please join us on Friday, December 13, 2013 at 6pm through Saturday, December 14 at 1pm for the second Christian Science Hackathon event. Want to share Wednesday Readings or your other citation research on specific topics? If you have a WordPress site you can now install the Pleasant Viewer plugin. It will let you and others easily publish and share citations online. It is Open Source (GPL licensed) and free to use and distribute. It is the result of the “Hack Your Church” hackathon at the U.C. Berkeley CSO this past weekend. Julian, Cameron, James and Gabriel all worked on the ideas. It uses Cameron’s cskit-rb library to retrieve citations. It’s still a little rough around the edges but works nonetheless. Check it out! The first hackathon (hopefully of many to come) was held at the Berkeley CSO (thanks for letting us use the building!) We ended up working on a new project called Pleasant Viewer, an Open Source WordPress plugin built on top of Cameron’s cskit framework. We’re really excited about Cameron’s work on writing an open source set of tools that will allow for studying, sharing and building new interfaces to the world of Christian Science text. Check it out on his cskit-rb Github page. If you’re adventurous and nerdy, you might even see what you can contribute to the project. He’ll be presenting his work so far at the upcoming CS Hackathon at the UC Berkeley CSO, which we’re also going to be participating in. See you there?